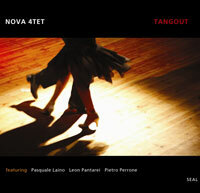 Tangout,the result of a great passion for music and a year of intensive work,is the first record project of NOVA 4TET, band born in april 2007 from the meeting of four musicians inspired by the desire to propose a music characterized by the fusion of a lot of genres. Tangout, unpublished song which gives the title to the work, was chosed to highlight the fundamental object of the disc: to offer sonorousness, arrangements and personal interpretations. Composed of eight songs that try to better reflect this intention,the Cd is characterized by a warm and pleasant atmosphere,the same one that was dominant in the recording studio between the members of the band,to try to obtain a good result,certainly in view of many new and exciting works. Salvatore Cauteruccio was born in Belvedere Marittimo (Cs) on 24-08-1977, he begins his studies applied to the accordion at the age of nine. Musicians full-time, he is director of the Musical Academy Cauteruccio (affiliated to the national Club Voglia d'Arte) and teaches instrument at the Musical Academy og Vallo di Diano (Sa). He studied histry,improvisation and Jazz orchestration at the musical institute G.Braga of Teramo (Italy) with the teacher Renzo Ruggieri. In 2003 he takes the diploma in teaching in the private school at the Academy Voglia d'Arte (Teramo,Italy). He asserted himself in several international competitions: Benevento 2004  2005, Castelfidardo 2006 where he was award the special prize IMAIE for film music; he writes articles for important reviews of the sector; he performed in concert in jazz festivals, music exhibitions and telecast (Tour Russia with a concert at the Kremlin in Moscow, European music festival, Rome,Concert of the 1° may, Naples, Rai1, Rete 4); He recorded for several musicians;he holds seminars in varioos musical schools to spread the culture of the instrument. 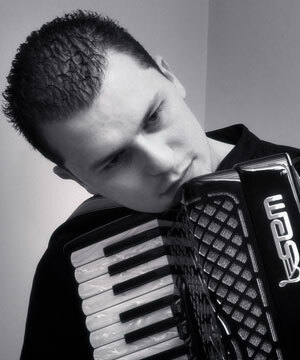 From July 2007 he is accordion teacher to the summer stage of Oriolomusica. He wrote and arranged music for theater shows (Cuntombre,oltre la strada,senso). At the moment in addition to collaborate with other musicians,he has two project:Nova 4tet with Enzo Campagna(guitar),Antonello Mango(bass),Angelo Sirufo (drums) and Acoustic Music Ensemble with Pietro Perrone(violin),Enzo Campagna(guitar). He is artistic director of the Buonvicino Art Festival and of the sections base/entertainment of the Club Voglia d'Arte. 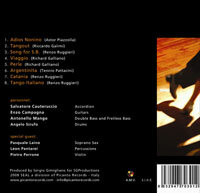 Renzo Ruggieri (Accordionist), Pasquale Laino (saxophonist), Angelo Sirufo (drummer), Leonardo Vulpitta (percussionist), Marco Di Natale (double bass player), Massimo Di Rocco (drummer), Enzo Campagna (guitarist), Antonello Mango (double bass player), Enzo D'Arco (director/theatrical actor), Pietro Perrone (violinist), Riccardo Galimi (pianist), Antonella Biondo (singer), Vincenzo Germano (bass player), Serafino (songwriter), Donato Santoianni (accordionist), Pasqualino Fulco ( guitarist), Andrea Fulco (bass player), Salvatore Barbuscio (double bass player), Paolo Marchese (trumpeter), Carmine Raimondi (drummer), Giovanni Reale (double bass player), Daniela Greco (singer), Luca Mulonia (drummer), Cristian Mele (trumpeter), Bernardo Tramontano (flautist), Giuseppe Miele (cellist), Gianluca Rando (guitarist), Romeo Lombardi (pianist), Max Barba (bass player).